Cho U wins Kisei A League: So Yokoku 9P was a little unlucky in the Kisei A League. He had won six games in a row and held the lead all the way (enjoying the sole lead in the 5th and 6th rounds), but he lost his final game to Cho U 9P on September 8 (taking black, Cho won by resignation). That left them tied on 6-1, but there is no play-off in the Kisei Leagues. Cho was ranked 4th to So’s 7th, so Cho won the league. He gets a seat in the irregular knock-out tournament to decide the challenger. Yo to challenge for Oza title: A week after the Tengen challenger was decided, another play-off between a veteran player and a new star was held and resulted in a win for the latter. On September 8, the 21-year-old Yo Seiki 7P of the Kansai Ki-in beat Takao Shinji in the play-off to decide the 64th Oza challenger. Taking white, Yo had white and secured a resignation after 190 moves. He commented that he was inspired by Ichiriki’s success. Yo had a frustrating history in play-offs, having lost to Iyama Yuta both in the Oza play-off last year and in the Judan play-off the year. As that shows, Yo played a crucial role in giving Iyama the opportunity to secure his Grand Slam. The first game of the Oza match will be played on October 17.
challenged for a while, but Yamashita and Takao had been doing a good job of holding back the younger players (except for Murakawa Daisuke). There could be big changes in the make-up of the tournament scene in the next few years. Xie makes good start in Women’s Honinbo defence: The first game of the 35th Women’s Honinbo title match was held at the Kashoen, a Japanese-style inn, in Hanamaki City, Iwate Prefecture on September 13. The challenger is Fujisawa Rina 3P. Playing black, Xie (right) forced a resignation after 151 moves. The second game will be played on September 26. Takao makes good start to Meijin challenge: Takao Shinji 9P has already improved on his performance in his Meijin challenge last year. The first game of the 41st title match was held at its usual venue, the Hotel Chinzanso Tokyo, on August 30 and 31. Playing black, Takao showed exemplary shinogi (living with a weak group) skills in weathering a fierce attack by Iyama Yuta Meijin. When the dust settled, he had a lead of about ten points on the board. 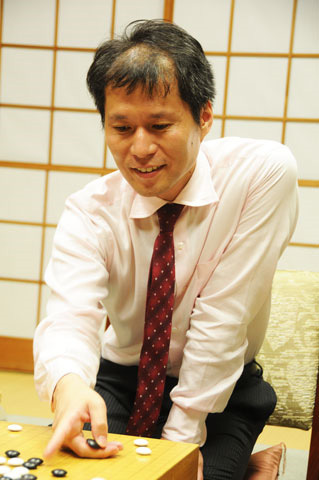 Iyama missed his best opportunities to complicate the game and resigned after 207 moves. In view of Takao’s past record against Iyama, it’s too soon to say he has an edge, but he has certainly made the series more interesting for fans. The second game will be played on September 14 and 15. At the party on the eve of the game, the players gave bouquets to Cho Chikun, who was the referee for the game. 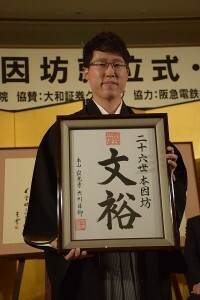 Having turned 60 on June 20, Cho is now entitled to use his Honorary Meijin title, though there’s a conflict with his title of 25th Honinbo Chikun. Cho said to the audience: “Wouldn’t you like to see a game to decide who’s stronger, the ordinary Meijin or the Honorary Meijin?” The audience cheered, but, needless to say, this game is not happening soon. Ichiriki to challenge for Tengen: Ichiriki Ryo 7P has become the second teenager to challenge for one of the top seven open titles. The first was the player whom he will be challenging. 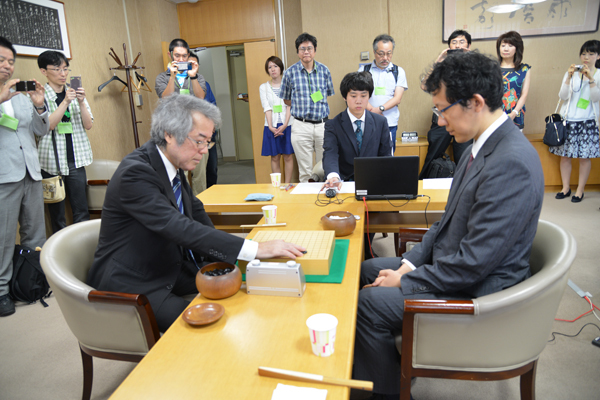 The play-off to decide the challenger for the 42nd Tengen title was held at the Nihon Ki-in in Tokyo on September 2. Playing white, Ichiriki beat Yamashita Keigo 9P by 4.5 points. There is a group of up-and-coming teenagers at the moment, but Ichiriki was probably the first of them to attract attention when he won a seat in the Kisei League at the age of 16 years nine months (still a record for any league). 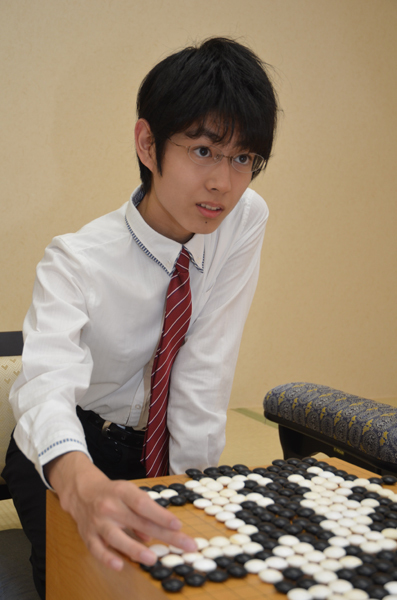 At 17, he became the youngest player to win the King of the New Stars title and came second in the NHK Cup, and in the same year he also won an international tournament for young players, the Globis Cup. This year he entered the College of Social Studies at Waseda University. A number of university students have turned professional after doing well in university tournaments, but this is the only case I can think of of someone entering university after already establishing himself as a top player. The go writer Akiyama Kenji claimed a while back in his column in “Go Weekly” that Ichiriki was a mathematical prodigy. According to Akiyama, someone had said to Ichiriki that he was barely a quarter of the age of the player he had played that day. Ichiriki asked when the player was born, thought for a couple of seconds and then said he was exactly 24.65% (or whatever) of the player’s age. Akiyama tested him for his article, but didn’t explore the ramifications of this talent. Women’s Meijin League: One game in the second round of the 29th Women’s Meijin League was played on September 1. Okuda Aya 3P (B) beat Aoki Kikuyo 8P, the previous challenger, by half a point. This is her second win, so Okuda shares the lead with Fujisawa Rina 3P (Aoki is 1-1 and all the other players are 0-1). (Sept. 2) (Round 1) Li (B) beat Cho U 9P (Japan by resig. ; Park Junghwan 9P (Korea) (b) beat Terayama Rei 4P (Japan) by resig. ; Shin (B) beat Mi Yuting 9P (China) by resig. (Sept. 3) (Round 2) Li (B) beat Yi Sedol 9P (Korea) by resig. ; Shin (W) beat Park by resig. (Sept. 4) (final) Li (B) beat Shin by resig. his debut in the league. If the 16-year-old Shibano had won their game, he would have set a new record for winning a league place just two years after becoming a professional. Ichiriki grabs share of Kisei S League lead: A key game was played in the Kisei S League on August 18. Playing white, Ichiriki Ryo 7P (right) beat Kono Rin 9P by resig. In the third round, Kono had taken the sole lead, but this win gave Ichiriki a share of the lead. It also helped out Murakawa Daisuke 8P, who had shared the lead with Kono in the second round. All three are on 3-1. 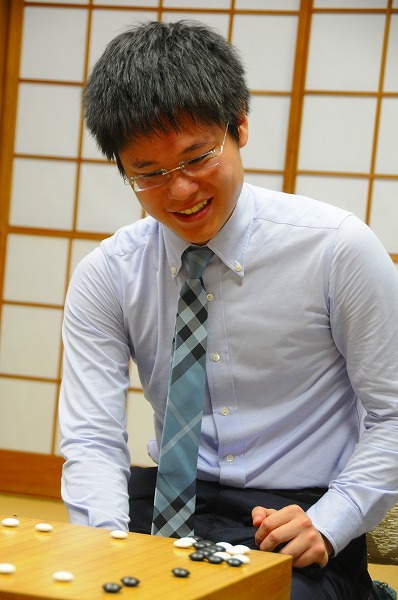 Oza challenger: Takao or Yo: Takao Shinji is doing badly in the Kisei S League, but he is doing well in other tournaments. Besides becoming the Meijin challenger, he has also reached the play-off to decide the challenger for the 64th Oza title. 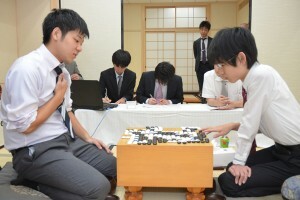 In the semifinal, held on August 15, Takao (B) beat Hane Naoki 9P by resig. His opponent in the play-off is Yo Seiki 7P, who beat Yamashita Keigo in the other semifinal, held on August 18. Taking white, Yo won by resig. If anything, Yo will be more determined to win the play-off than Takao, as he has missed a number of opportunities recently. Last year he lost the Oza play-off to Iyama Yuta, who went on to take the title. Yo also lost this year’s Judan play-off to Iyama, giving the latter his chance to try for a grand slam. Yo will be hoping for third time lucky. 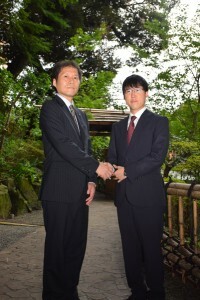 New Honinbo League: Two of the four vacant seats in the 72nd Honinbo League have been decided. On August 18, Ko Iso (W) beat Tsuruyama Atsushi 7P by resig. ; on August 25, Yuki Satoshi 9P (B) beat Cho Sonjin 9P by resig. Start of new Women’s Meijin League: The first round in the 29th Women’s Meijin League has been completed and one game in the second round has been played. Results are given below. (August 11) Fujisawa Rina 3P (B) beat Sakakibara Fumiko 6P by 19.5 points. (August 18) Aoki Kikuyo 8P (B) beat Ishii Akane 2P by resig. ; Okuda Aya 3P (B) beat Kato Keiko 6P by resig. (August 25) Fujisawa Rina (W) beat Suzuki Ayumi 7P by resig. For the time being, Fujisawa has the sole lead on 2-0. One thousand wins to Hikosaka: On August 18, Hikosaka Naoto 9P (right) became the 19th Nihon Ki-in player to reach the landmark of 1,000 wins. He had 544 losses, 3 jigos, and 1 no-result for a winning percentage of 64.8. At 54 years 5 months, Hikosaka is the 10th oldest to reach this mark. It took him 40 years 4 months, which is the 10th quickest. His winning percentage is the 10th highest. Hikosaka won the Judan title in 1998 and came fourth in the 11th Fujitsu Cup in the same year. He has played in the three leagues once each. Tengen challenger: Yamashita or Ichiriki: The semifinals in the 42nd Tengen tournament were held on August 22. Yamashita Keigo (B) beat Kyo Kagen 4P by resig. and Ichiriki Ryo 7P (W) beat Murakawa Daisuke, also by resig. Veterans dominate Agon Kiriyama Cup: The go press in Japan has been making much of a number of strong teenagers who have emerged in the last couple of years. However, the older generation is not moving aside graciously for them. The line-up in the 23rd Agon Kiriyama Cup semifinals illustrates this. The pairings are: Cho Chikun (aged 60) v. Takao Shinji (aged 39) and Yamashita Keigo (aged 37) v. Kono Rin (aged 35). That’s an average age of nearly 43. It’s hard to imagine this happening in Korea or China. The semifinals were played on August 25. Cho (W) beat Murakawa by resig. and Kono (W) beat Yamashita by 1.5 points. 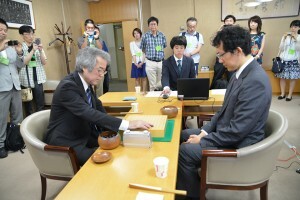 Takao to have another crack at Meijin title: All the games in the final round of the 41st Meijin League were held on August 4. At this stage, three players were still in the running to become the challenger. With only one loss so far, Takao Shinji 9P (right) was one point ahead of Cho U 9P and Murakawa Daisuke 8P, who were both on 5-2. Besides winning his own game, Cho needed Takao to lose for him to make a play-off. Conditions were tougher for Murakawa, however. Only the two higher-ranked players qualify for a play-off in the Meijin League. That meant that Murakawa needed both Takao and Cho to lose, in which case he would meet Takao in a play-off. Go Weekly claimed that the odds of this happening were only one in 16. Takao made these calculations irrelevant by winning his game; this avoided a playoff in the league for the first time in six years. We have just seen Yamashita make three challenges in a row in the Kisei title; Takao is following in his footsteps with his second successive challenge in the Meijin title, not to mention his recently concluded Honinbo challenge. He will be hoping to do better than last year, when he failed to win a game. Apart from Murakawa, Iyama’s main opposition is still coming from older players. (July 7) Cho U 9P (B) beat Murakawa Daisuke 8P by 2.5 points; Kono Rin 9P (B) beat Hirata Tomoya 7P by resig. (July 21) Takao Shinji (W) beat Uchida Shuhei 7P by resig. (Final round, August 4)Takao (B) beat Ko Iso 8P by resig. ; Yamashita (B) beat Cho U by resig. ; Murakawa (B) beat Kono Rin 9P by resig. ; Hirata Tomoya 7P (W) beat Hane Naoki 9P by resig. The order after Takao is: 2. Murakawa (6-2); 3. Yamashita (5-3); 4. Cho (5-3); 5. Kono (4-4); 6. Ko (4-4). Hane (3-3), Hirata (2-6), and Uchida Shuhei 7P (0-8, bye in last round) lost their places (that had already been decided before the last round). The first game will be played at the Hotel Chinzanso Tokyo on August 30 and 31.
n August 8, Fujisawa (W) beat Suzuki Ayumi 7P by resig. after 150 moves. The title match will start on September 13. Rina turns 18 on September 18. Kono has sole lead in Kisei S League: After three rounds, Kono Rin 9P is the only undefeated player in the 41st Kisei S League. In his third-round game, Kono defeated the joint leader after two rounds, Murakawa Daisuke 8P. Level with Murakawa in second place is Ichiriki Ryo 7P. This is a small league, with only five rounds, so Kono is well positioned. In the eight-player A League, So Yokoku 9P has the sole lead with five straight wins. Closest to him is Cho U 9P on 4-1, the other players have suffered two or more losses, So and Cho will meet in the final round. In the seven-round B1 League, Kyo Kagen 4P has the sole lead with 6-0, followed by Cho Chikun 9P on 5-0. In the B2 League, Ko Iso 8P has the sole lead on 5-1, followed by Yuki Satoshi 9P and Yo Seiki 7P on 4-2. (July 7) Yamashita Keigo (W) beat Yoda Norimoto 9P by 1.5 points. (July 14) Ichiriki (B) beat Takao Shinji by resig. (July 21) Kono (W) beat Murakawa by resig. 900 wins for Hane: Hane Naoki (right) has reached the landmark of 900 wins. At 39 years 11 months, he is the fourth youngest to do so. It took him 25 years three months, which is the third quickest. His winning percentage at this point of 66.6 is the 12th best. Ito Makoto was born on August 4, 1945 in Shiga Prefecture. He became a disciple of Kitani Minoru and made 1-dan in 1964. He reached 8-dan in 1989 and was promoted to 9-dan when he retired in 2005. Ishida wins 13×13 tournament: The final of the 1st 13×13 Pro-Amateur Tournament was held at the Nihon Ki-in in Tokyo on July 23. Ishida Yoshio (also known as 24th Honinbo Shuho, left) (B) beat Kono Rin 9P by resig. This is the second 13×13 tournament based on crowd funding on the Net. Ishida also won its predecessor, held two years ago. 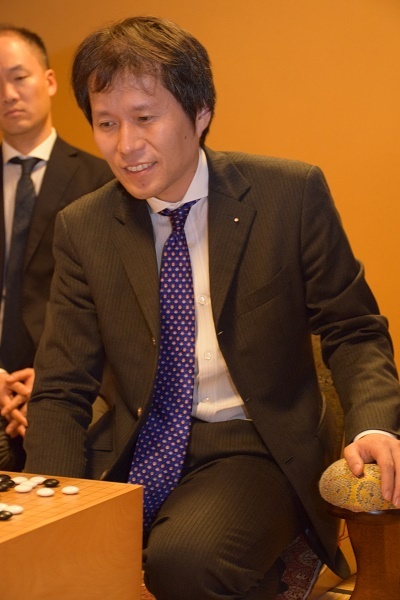 He commented: “It would be nice if all professional tournaments were 13×13.” Amateurs and a software program also competed in the preliminary tournament (competing for two seats out of the 16 in the main tournament). The first prize is 600,000 yen. The minimum donation for people wishing to help fund the tournament is 3,000 yen. If you make a donation, you also get to vote in choosing the professional participants. Iyama defends Gosei, maintains grand slam: The second game in the 41st Gosei title match was held at the Hokkoku (North Country) Newspaper Hall in Kanazawa City, Ishikawa Prefecture on June 18. Taking white, Iyama (left) completely outplayed the challenger, Murakawa Daisuke 8P, in the middle game and forced a resignation after 150 moves. A little unusually for him, Iyama set up a large moyo. One of his groups came under attack, but he settled it in sente and was able to add a key capping move to his moyo. Murakawa had to invade, but his group was kept down to one eye by Iyama. The third game was held at the Kansai Headquarters of the Nihon Ki-in in Osaka on July 28. The course of this game was quite different from the previous one. Just about all title-match games are played aggressively, but even so this game stood out for its fierceness, being one ceaseless fight from beginning to end. Playing white, Murakawa matched Iyama blow for blow and took the lead. At one point, Iyama was even wondering if he should resign. However, Murakawa missed a number of good ways to simplify the game in his favor. After creating complications, Iyama took the lead in the midst of some hectic fighting. 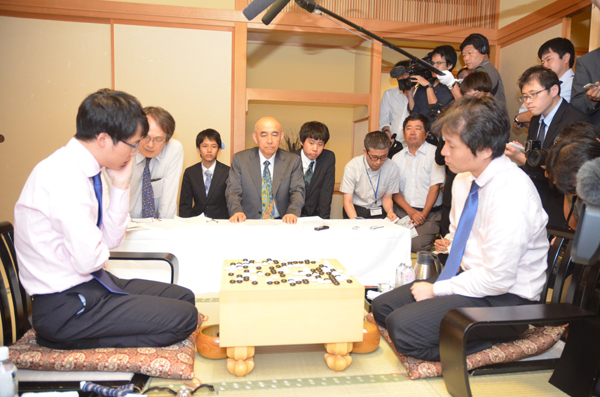 After 269 moves, Murakawa resigned, so Iyama (Black) defended his title with straight wins. This was his fifth successive Gosei title, so he has qualified for his second honorary title. Iyama’s comment: “You rarely get a chance like this [for an honorary title], so I thought I would go all out. I’m happy, but, considering my ability, this is too much. 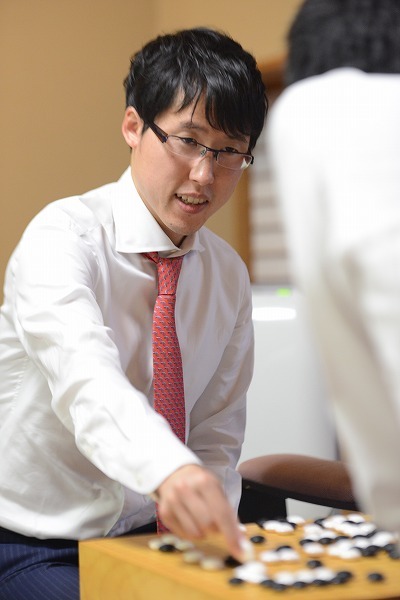 I want to get stronger so I can play games I’m not ashamed of.” Murakawa is considered one of the foremost players in the “post-Iyama group,” but his record against Iyama is now 3-13. Among the established players, there is no one who appears to be a likely threat to his septuple crown. 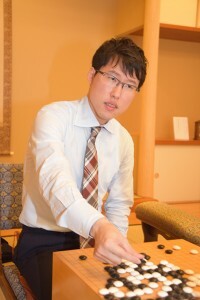 That’s not to say that he is invincible in Japan: he was eliminated from the Agon Kiriyama Cup, a tournament in which he usually does well, by Hane Naoki in the round of 16 on July 21. 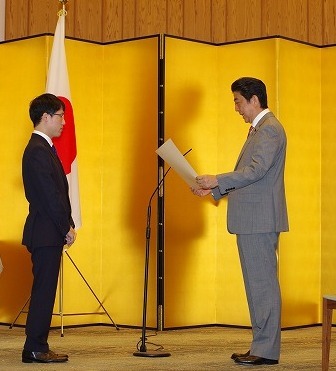 Iyama honored by Prime Minister: On June 16, Iyama Yuta was given a certificate of commendation by the Prime Minister of Japan, Abe Shinzo, in recognition of his feat in achieving the first grand slam in go. He received the certificate in a ceremony at the Prime Minister’s residence. He is the first go player to be so honored. Kobayashi Koichi wins Master’s Cup: The final of the 6th Igo Fumakira (= fume killer, the name of the main sponsor, an insecticide manufacturer) Master’s Cup was held in the Ryusei TV Studio in the basement of the Nihon Ki-in in Tokyo on July 9. Playing white, Kobayashi Koichi, Honorary Kisei, defeated Awaji Shuzo 9P by resig. after 174 moves, winning this title for the first time. This took his tally of titles to 60 (third after Cho Chikun and Sakata Eio). Kanren and Gen’an Inseki inducted into Hall of Fame: At a meeting of the Go Hall of Fame Induction Committee on July 19, it was decided to add two famous figures from go history to the Hall of Fame. Kanren is a priest from the Heian period who is known to history as the author of a work on go called The Go Rites (Goshiki), which he presented to the emperor of the time (her served Emperor Uda, reigned 887 to 897, and Emperor Daigo, reigned 897 to 930). The book has not survived, but is surmised to have dealt with the rules of go and go etiquette. Kanren was apparently very fond of go and was known as a go saint. The second inductee was Gen’an (or Gennan) Inseki (1798-1859), the 11th head of the Inoue house, who was a leading rival of the Honinbo house, especially Honinbo Jowa, in the 1830s and 1840s. He was one of the central figures of the go world in its most prosperous age in the Edo period. His ambition to become Meijin was frustrated by the Honinbos, but he remains one of the most colorful figures of go history. match between Yamashita Keigo and Iyama Yuta looks unlikely, as Yamashita has lost his opening two games. Murakawa Daisuke 8P and Kono Rin 9P, both on 2-0, share the lead. (May 12) Ichiriki Ryo 7P beat Yoda Norimoto 9P by 4.5 points. (May 19) Kono Rin 9P (W) beat Takao Shinji 9P by resig. P (W) beat Ichiriki Ryo 7P by resig. (June 23) Yoda Norimoto 9P (B) beat Takao Shinji 9P by half a point. (May 26) Murakawa Daisuke 8P (W) beat Yamashita Keigo 9P by 2.5 points. The eight-player A League has already concluded three rounds. The bottom-ranked player in the league, So Yokoku 9P, is the only undefeated player, on 3-0. His nearest rivals are Ryu Shikun 9P and Awaji Shuzo 9P, who are both on 3-1. 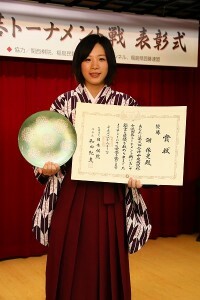 Xie wins 3rd Aizu Central Hospital Cup: The final of the 3rd Aizu Central Hospital Cup, the only two-day game in women’s go, was held at the Konjakutei inn in Higashiyama Hot Spring in Aizu Wakamatsu City on June 17 and 18. Xie Yimin (W, right) beat Aoki Kikuyo 8P by4.5 points and won this title for the first time. 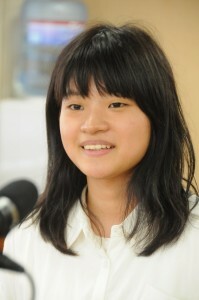 Xie became the first quadruple title-holder in women’s go in Japan. This is her 23rd title. Iyama Yuta defends Honinbo title: The fifth game of the 71st Honinbo title match was held at the Yoshikawaya inn in Iisaka Hot Spring, Fukushima City on June 29 and 30. Taking black, Iyama forced a resignation after 177 moves. After losing the opening game, Iyama won four in a row to defend his title. This is a landmark victory for him, as it secures him his first honorary title, which requires you to hold the title for five years in a row. 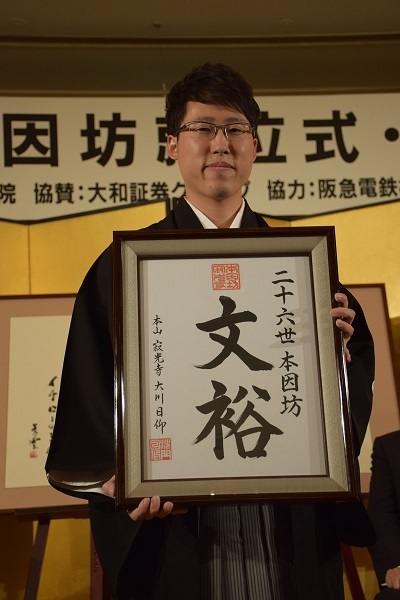 Actually, in the case of the Honinbo title the wording is actually “eternal Honinbo;” Iyama will become “26th Honinbo,” followed by the special name he chooses for himself (he will unveil it at the award ceremony later this year). He will use the title when he turns 60. Just for the record, his predecessors are 22nd Honinbo Shukaku (Takagawa Kaku), 23rd Honinbo Eiju (Sakata Eio), 24th Honinbo Shuho (Ishida Yoshio), and 25th Honinbo Chikun (Cho Chikun; Cho won 11 titles in a row, so he assumed the title immediately after his 10th term). The fifth game was the usual fierce fight between Iyama (black) and Takao. Both sides made moves they were dissatisfied with in the earlier part of the game, but it remained evenly balanced. A little after 100 moves, Iyama played a well-timed peep that helped him secure a group in sente, enabling him to switch to a big endgame point. This gave him the lead and, although there was a lot more fighting, he hung on to it. Takao resigned after 177 moves. Besides becoming the first player for 23 years to earn an honorary title (the last was Rin Kaiho in the Tengen title), Iyama also maintained his septuple crown. Fukushima City was the birthplace of the 6th Honinbo Shuhaku (1716-41); the game was played there to commemorate the 300th anniversary of his death. He became the head of the Honinbo house at the age of 18 but died young. His main grave is at the Honmyoji Temple in Tokyo, but a portion of his bones are buried at the Josenji temple in Fukushima. The day before the game, the players visited the temple to pay their respects to him. Incidentally, this game was the 400th title-match game in the modern Honinbo tournament. (May 12) Ko Iso 8P (B) beat Yamashita Keigo 9P by 1.5 points. gue place; Hirata has an outside chance of keeping his. (June 2) Kono Rin 9P (B) beat Ko Iso 8P by half a point. (June 9). Hane Naoki 9P (W) beat Uchida Shuhei 7P by resig. (June 20) Takao Shinji 9P (W) beat Cho U 9P by half a point. (June 30). Yamashita Keigo 9P (W) beat Hane Naoki 9P by resig.